The Finance Commission had a budget briefing on April 1, 2019. 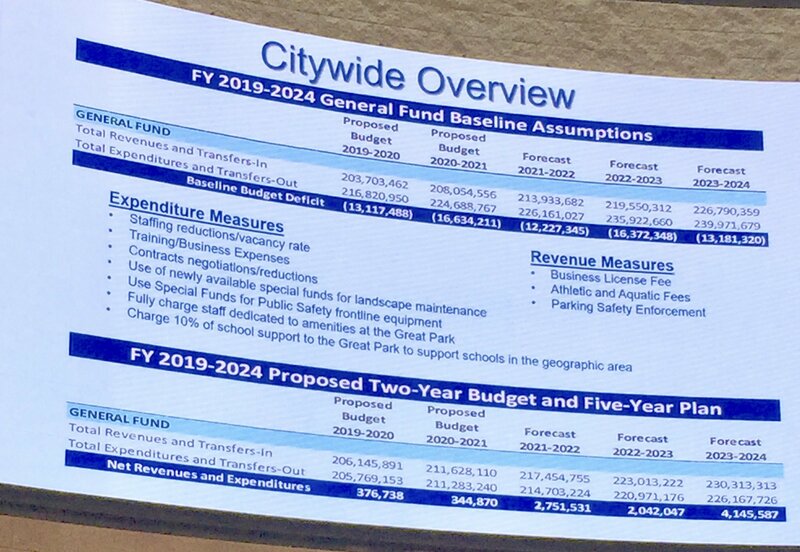 The photo is a chart from the presentation that addressed budget balancing ideas. April is the budget season and the Finance Commission will hold their second meeting of the month on Monday, April 8. It’s worth your time to come and hear the various City Department presentations and the current thinking of how to balance the City budget. Expenditure Measure: Recommending taking 10 percent of the revenue generated from the Great Park and giving it to the schools. Commissioner comments: Commission Chair Stein asked if taking revenue generated inside the Great Park can be used for school-related purposes. He wondered if the revenue generated from inside the Great Park needs to stay inside the Great Park budget for the operation and maintenance of the Great Park. Public comments: A comment from the public centered on the need for a Great Park finance transparency portal and asked why would we siphon money from the Great Park to another city fund when we need it to finish building the Great Park. Background: Budget shortfalls are forecast in the coming years. Therefore, the City Manager’s office asked all entities that receive money from the City to find ways to reduce costs. As part of this, the Irvine schools were asked to find ways to reduce the school budget by $2M. However, due to a strong push back from Irvine parents, this request was dropped. The consequence of dropping this request to the schools means that the $2M will need to be taken from funds that would have been allocated to other City departments or organizations. Is it legal to transfer Great Park funds to the school coffers? If it is, since the Great Park budget is projecting shortfalls of its own, is it still a good idea to take these Great Park funds? Revenue Measure: Recommending more parking ticket officers. Irvine is growing so the city wants to hire three additional parking enforcement officers to generate more revenue. Revenue Measure: Recommending reinstating the business license fee. In June of 2015, the Irvine city council eliminated the $51 business license fee. Staff is now recommending that a business license fee is reinstated to help with budget shortfalls. This post was written by Irvine residents Sylvia Walker and Jeanne Baran.